Is it play? Probably competition! Tree Swallows glisten in the June sunlight, as they swoop and glide, their arcs interlacing in the air. When a white feather flutters down among them, one swallow snatches the feather in its bill and flies upward, as another gives chase. After a moment, the lead bird lets loose the feather, which drifts lazily, until the second bird swoops to catch it in midair. 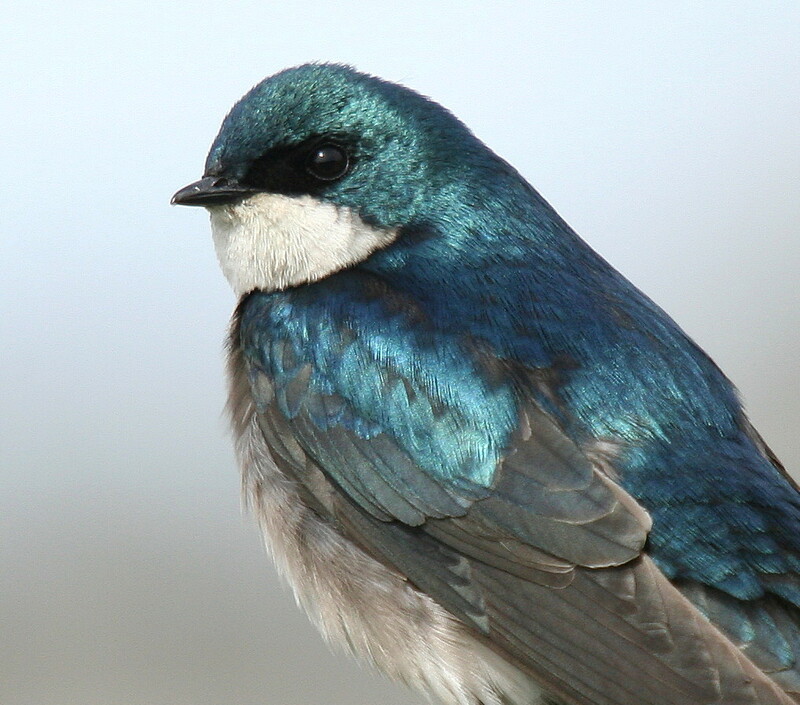 Loose feathers are important for Tree Swallows. They line their nests thickly with them. A white feather flutters down among them. 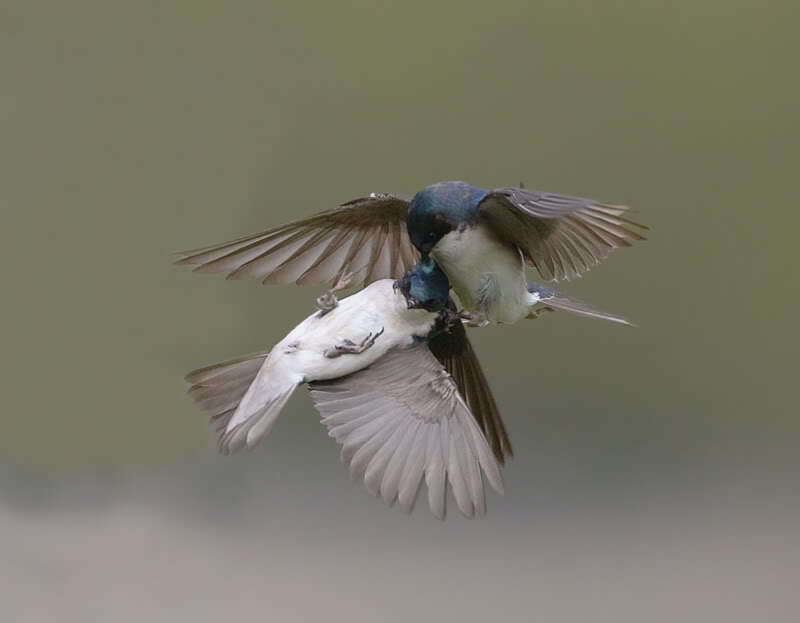 One swallow snatches the feather in its bill and flies upward, as another swallow gives chase. After a moment, the lead bird lets loose the feather, which drifts lazily, until the second bird swoops in to catch it in midair. The aerial ballet of swallows and feather swirls on for minutes, as other swallows join in the feather chase. Are the swallows just playing or are they competing for these feathers? 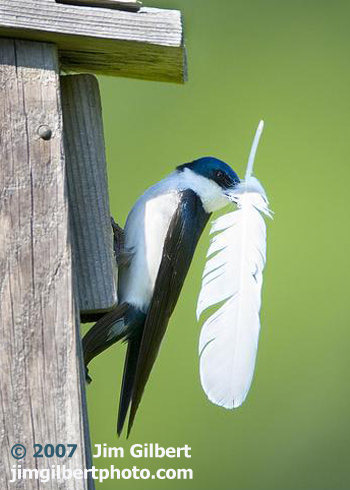 Loose feathers are an important resource for Tree Swallows. They line their nests thickly with them, a featherbed for nestlings. 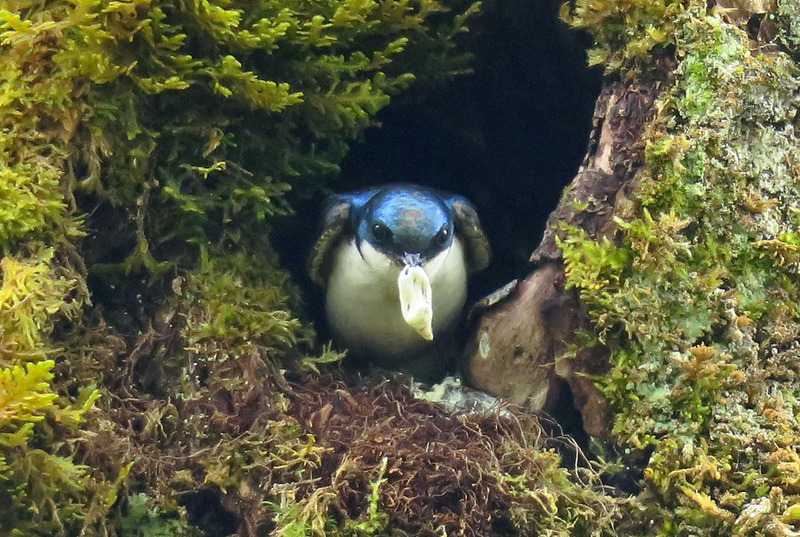 Continuing research suggests that, as Tree Swallows build their nests, it is the females who collect the feathers. Their aerial dance may well be a competition for nest-lining material. Bird sounds provided by The Macaulay Library at the Cornell Lab of Ornithology, Ithaca, New York. Recorded by G.F. Budney. Nancy Rumbel composed and played the theme music. Research cited: see Cornell Hughes Scholars website, 2006.